Upon the backs of vultures, adventure flies. Upon the edge of the Gray Pools lies the town of Grafika, a squalid heap of cobbled roads and ruined buildings where the washed up remnants of a shattered empire gather. Here the wealth of the empire's ruin passes through the small hands of small men; here the echoes of its glory ring hollow. Over a morass of pools and mired swamps the Vessel of Souls fled, carried upon the wings of a black-hearted vulture. To look upon the Vessel is to know desire; to hold the Vessel overlong in one's grasp invites madness. Desired by wizards, sorcerers, the men of gods and princes, the Vessel is worth untold riches. But more, the Vessel serves the Undying Lord of Aufstrag; without it, he is bereft of power. The Vessel of Souls has wound its way to Grafika and the PC's must track it down and find it before the agents of Undying Lord of Aufstrag. But the town is as much a part of the wilderness as the morass that surrounds it. Getting to Grafika is no easy task, and navigating its ruins even harder. 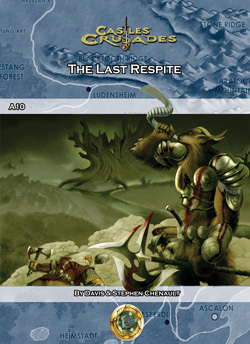 The Last Respite is an adventure designed for 3-5 characters of 10th-12th level. It is designed for modular play or as an area to explore. Play with your homebrew game or in the world of Aihrde.